Updated story: click here for the ratings from Thursday's events. Fox News has found itself in a highly unusual position: In the midst of a P.R. nightmare with no easy way out. Donald Trump's repeated attacks on the network -- including accusations of bias -- have generated foul headlines and some blatant falsehoods. 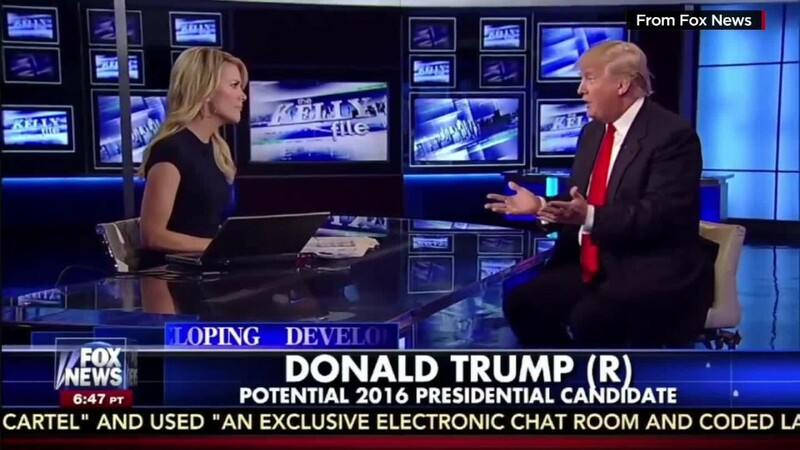 Trump is boycotting Thursday night's GOP debate on Fox News. The move is likely to put a damper on the event's ratings since other channels are expected to televise Trump's competing event at 9 p.m. Eastern time. That's precisely what Trump wants -- to hit Fox where it hurts, in the ratings race and in its advertising sales. Trump tweeted on Wednesday night and again on Thursday morning that ad rates for the debate are falling "like a rock." "The 'debate' tonight will be a total disaster -- low ratings with advertisers and advertising rates dropping like a rock," he wrote. Some of his supporters have even spread rumors via social media about advertisers abandoning the debate. There is no evidence that any of this is true, however. Ad rates for special events like primary debates are typically set weeks and even months ahead of time. Once an advertiser makes a commitment, networks generally don't give discounts. A Fox News spokesperson refuted Trump's claim in a statement on Thursday. "The debate is completely sold out," the network said. "No rates have changed and there are no advertisers who have backed out. Prices don't change once the orders have been placed." There is one caveat: If the ratings are lower than expected, Fox may have to give advertisers extra ads for free later. These are known as "make-goods" in the TV industry. Fox declined to say how much it is charging for 30-second ads during the debate. According to The Wall Street Journal, "ad time in Thursday's debate went for as much as $260,000 for 30 seconds... Spots sold after Mr. Trump pulled out went for roughly $200,000, which is still a premium rate for a debate." Because Trump has fueled record ratings, dating back to Fox's first GOP debate last August, networks have been able to charge pricey sums for ad time all season long. Fox's August debate averaged a record-smashing 25 million viewers. The channel did not expect to top that total on Thursday, even with Trump. More recent debates have generally had lower viewership; the most recent GOP debate, on Fox Business, had 11 million viewers. But even at 11 million, these debates, with Trump at center stage, have been huge "hits" in TV parlance, drawing two to three times the audience for equivalent primary debates in 2008 and 2012. Trump is well aware of that fact; he frequently brings it up during rallies and press conferences. So his decision to forgo the debate will test just how much ratings magnetism he really has. Trump's campaign runs the risk of overstating his power. Campaign manager Corey Lewandowski has said only "1 or 2 million people" will tune in, while TV industry executives expect upwards of 10 million will watch the debate, even without Trump. No one will know for sure until Thursday night's ratings are released by Nielsen on Friday. What's already clear is that Fox's P.R. nightmare extends beyond the ratings race. Fox News chief Roger Ailes, a conservative political power broker who is usually praised and feared by peers and rivals, is now being second-guessed and scrutinized. The conservative web site Breitbart wrote Wednesday that "Trump beat Roger Ailes at his own game." And Fox host Bill O'Reilly is being ridiculed for pleading with Trump to attend the debate during an interview on Wednesday. The headline on The Drudge Report overnight was "O'REILLY BEGS TRUMP." But Fox's view is that it is holding steady, preparing for its big debate and not letting Trump's attacks influence its journalistic decision making. Trump has been criticizing Fox as a whole, but he has mostly singled out Kelly, the channel's 9 p.m. host and a co-moderator of its GOP debates. The candidate started saying last Saturday that Kelly shouldn't be allowed to moderate the debate. Ailes snapped on Tuesday afternoon after Trump posted an Instagram video that trashed Kelly. He drafted a statement, issued by his spokesperson, that said, "We learned from a secret back channel that the Ayatollah and Putin both intend to treat Donald Trump unfairly when they meet with him if he becomes president -- a nefarious source tells us that Trump has his own secret plan to replace the Cabinet with his Twitter followers to see if he should even go to those meetings." Ailes might've thought he was defusing the situation through some tongue-in-cheek humor, but Trump was incensed by it. He called it a "taunt" and he went after Fox -- warning that he'd skip the debate and hold his own event instead. Since many Fox fans are also Trump fans, the candidate is driving a wedge between them. Fox's view is that Trump was looking for a reason, any reason, to skip the debate -- so he seized on Kelly as the excuse. But some observers believe Ailes miscalculated and overstepped. The conservative thinker William Bennett said Thursday, "The statement invoking Putin and the Ayatollah was way out of bounds and incidentally gave Trump the opportunity to do exactly what Fox News was hoping to avoid: exit the debate with a clear conscience." New York magazine reported on Wednesday that there is internal dissent about Ailes' handling of the situation. The New York Times, however, said overnight that Fox's ultimate owner, Rupert Murdoch, is supporting Ailes.